A swimming teacher is helping people to create their legacy. Verna Scott-Culkin lost her dad and mother-in-law in a short space of time. Her grief made her think about ways of preserving loved ones' memories. 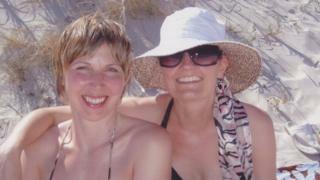 But it was when her close friend, Bev, was diagnosed with breast cancer that she decided to write a book. Here is her story. "I lost my dad in 2003. Then five years later my mother-in-law passed away from Alzheimer's disease. A few months after losing her, my best friend told me that she had been diagnosed with breast cancer. She has gone through treatment and is now in remission thank goodness, but at the time of her diagnosis she had two young children aged seven and 10. "I had so many conversations with my friend about how she felt about the possibility of her not seeing her children again and how they would carry on without her. It was therapeutic for both of us to talk about. "Conversations about dying and death are about funeral arrangements, finances and logistics - what we don't often talk about are the things that make us, us. "I'm sure we've all thought about what songs we'd like to be played at our funeral, but really we don't talk about it much because we don't want to upset others. "Some people think it's morbid but I think it's a really useful place to start, to get you thinking about your legacy. "The book has headings such as: 'My wishes for you all' and 'Recipes'. You can write about what you'd like to say to people, and your last words. Food recipes are great but if you don't cook, you can offer a recipe for a good marriage or other life tips. "You can write down some wise words. My dad would have filled the book with his - he had so many! "There's also a section about milestones and celebrations - this makes life easier for your loved ones as they know what you would have wanted them to do on your birthday or at Christmas. It can be really be instructive and it takes away the burden of loved ones trying to guess. "At the back of the book, there's an envelope which is for your funeral arrangements. So, when you die your loved ones know exactly what you would have wanted. Having the envelope means they don't have to read the rest of the book, that comes with time, but the envelope is a place to go to to sort out the funeral. "I'm just a swimming teacher, I've never done anything like this before. I have two children and I am pleased I have written this."